My photo and Jacob Wheeler’s text in print! 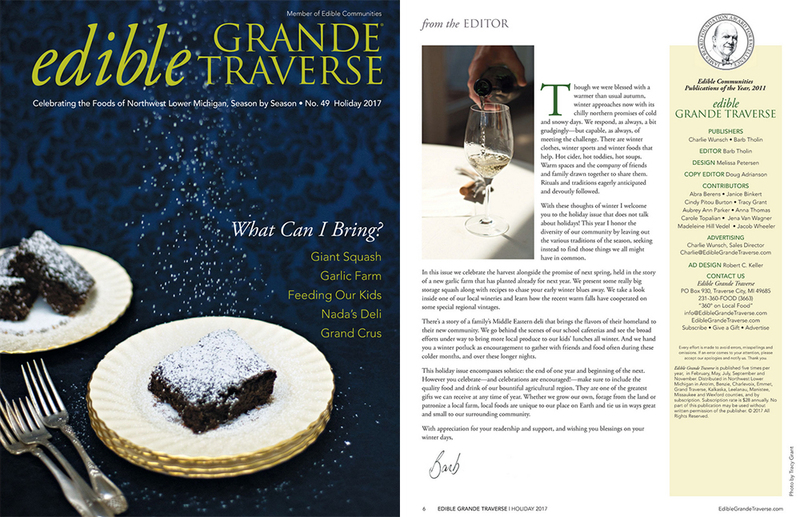 My friend Jacob Wheeler wrote a story about a new-ish Middle Eastern restaurant in Traverse City for Edible Grande Traverse, and a photo of mine published alongside Jacob’s text! The article includes great descriptions of some scrumptious food — yes, I know that it’s scrumptious, because I got to down a plateful or two when I was shooting the party, and I greatly approve! — as well as Nada Saco’s life story; how her family emigrated from Iraq during the 1980s to keep her brother out of Saddam Hussein’s military, how she became a self-taught cook while being a stay-at-home mother of four, and how she and her husband became owners of a gas station, a pizzeria, a carwash, and eventually a liquor store, out of which the deli operates. 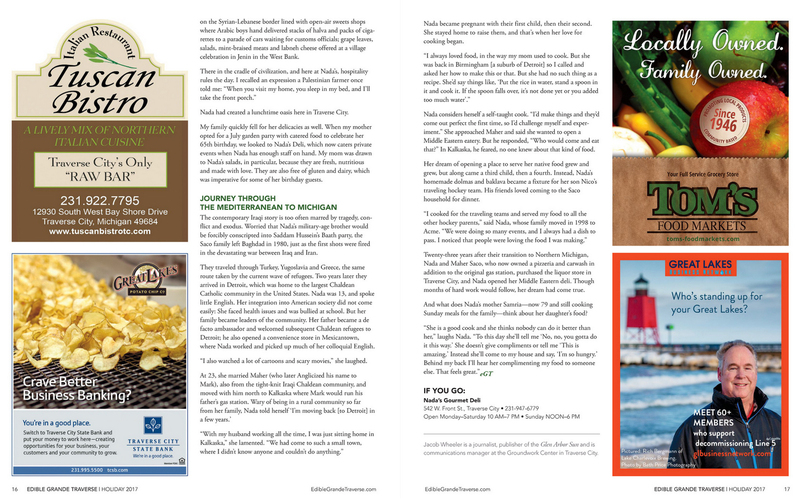 See the spread of both words and text below, or click here for the online edition! 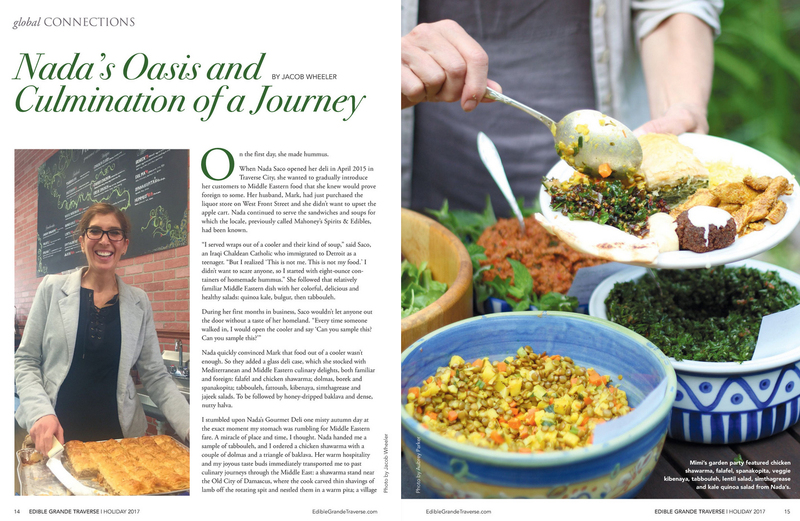 (Note: Only the full-page food photos is mine; the portrait of Nada is Jacob’s.) 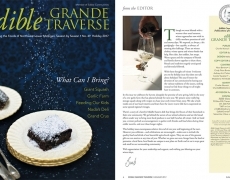 See my other work for Edible GT on my blog here.